Amish Christmas at North Star! 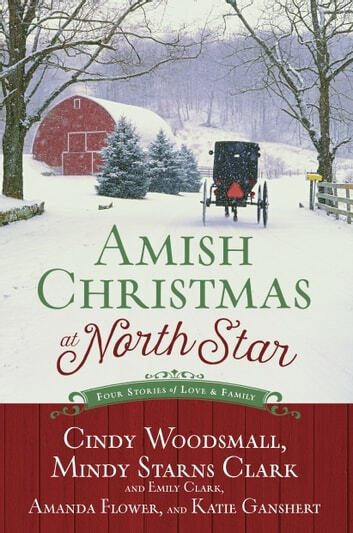 Amish Christmas at North Star contains four Amish Christmas stories set in North Star, Pennsylvania. The stories are written by Cindy Woodsmall, Amanda Flower, Katie Ganshert, and Emily Clark and Mindy Starns Clark. On November 30, 1990 a blizzard is coming through the area and midwife, Rebekah Schlabach delivers four babies. Twenty-five years later Chase Wellington discovers an article in his mother’s attic on what were called Rebekah’s Babies. Chase believes a follow-up story would make a good article for the North Star Tribune where he is a part-time reporter. Guiding Star by Katie Ganshert takes Chase on a search for the child that disappeared after its birth. It will take Chase and Noelle “Elle” McAllister on a journey to find out what happened twenty-five years ago. Mourning Star by Amanda Flower is an Amish Mystery. Eden Hochstetler is living Sugarcreek, Ohio with her parents. They moved there from North Star, PA. A friend of Eden’s, Isaac Yoder passed away at Yoder Stables. Eden wants to find out what happened to Isaac. She does not believe his death was an accident. Eden with the help of Jesse Yoder, Isaac’s nephew, sets out to find out what happened to her friend. Cindy Woodsmall’s In the Stars is about lost love. Savilla Beiler rejected Kore Detweiler. So Kore moved away to Virginia. He works with Esther and Jacob King on their salvage and decorating business. Business takes him back to North Star and a family emergency keeps him there. Mammi D is injured and she needs someone to watch the Adler kids while she is laid up (their parents are in Uganda adopting a child). Savilla and Kore end up working together to take care of the kids. Will Kore be able to find out why Savilla turned him away? Star of Grace by Mindy Starns Clark and Emily Clark is the last story in the book. Andy Danner left North Star after Nellie Umble broke up with him. Andy has been working in construction in Mississippi. Andy’s little brother, Sam misses Andy and works out a way to bring him home for Christmas. Nellie is very sorry that she broke up with Andy and wants him back. Can Sam get Andy back to town in time for Christmas and keep him there? There is an enjoyable epilogue that ties up all the storylines in the book. All four stories are just wonderful. I loved this book. It will help put you in the mood for Christmas. Amanda Flower’s Mourning Star had a good mystery, enjoyable characters, and some delicious descriptions of fudge. Amish Christmas at North Star is a heartwarming and well-written book. You will not go wrong in reading Amish Christmas at North Star. I give Amish Christmas at North Star 5 out of 5 stars. I liked how all these stories were written by different authors by you would never know it. They all tied together beautifully. 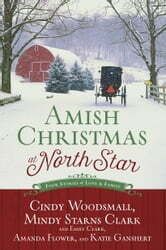 I received a complimentary copy of Amish Christmas at North Star from Blogging for Books (and the publisher) in exchange for an honest review.